A foreclosure is a legal process by which a borrower who is in default on the mortgage payments loses their property. When a borrower signs the Deed of Trust to purchase a home, they promise to pay back the borrowed amount. The Deed of Trust outlines the lien holder’s (lender’s) rights to acquire the property if the borrower fails to continue payments as promised. In other words, foreclosure is a legal procedure that the lender initiates in order to sell the property and satisfy the unpaid secured debt. The county will then send out a foreclosure notice to the borrower and all lien holders informing all parties that the property is in foreclosure and will be publically auctioned at the county sale. The date of the public auction sale is 110-125 days (approximately four months) after the foreclosure is filed. The 110-125 day time period is called the “Cure Period.” During this time, the borrower has the right to “cure” the default by paying off the past due amount. If the borrower cures the property, it will stop the foreclosure 100% and the borrower may resume payments, including penalties and fees, as originally agreed upon before the hardship. If the borrower does come up with the funds to cure the debt they must file a “Notice of Intent to Cure” at least 15 days prior to the Public Trustee’s Sale. The borrower must pay all funds to the Public Trustee to cure the property by 12 o’clock noon the day before the scheduled public auction. If there is no “Notice of Intent to Cure” filed, the property will go to sale on the date scheduled. The one exception to the process occurs if the lender agrees to postpone the sale date. Since the lender initiated the request for foreclosure proceedings, they alone have the right to stop or postpone the sale. Often, if the borrow is in the process of a loan modification or a short sale, the lender will postpone the foreclosure sale date to allow more time to come to an agreement and avoid the foreclosure. The lender can delay the foreclosure sale for up to 12 months. If they need to postpone the foreclosure sale further they must reinitiate the process from the beginning and have their attorney file the foreclosure with the public trustee again. When the foreclosure sale takes place, technically the borrower must transfer possession immediately, however, sometimes the borrower receives a grace period of 7-14 days to vacate the property before the lender demands possession. 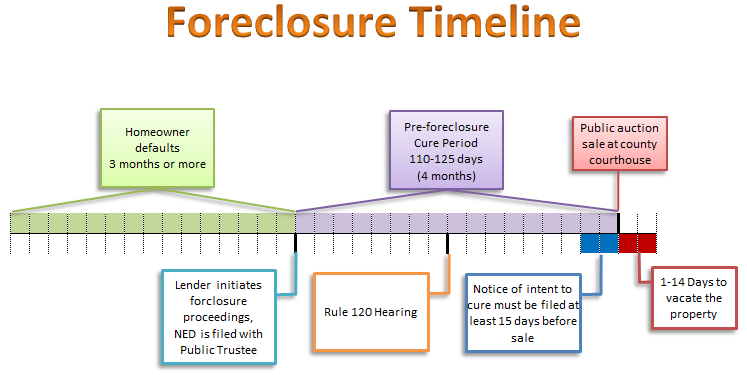 During the cure period the borrower will receive a notice from the public trustee for a “Rule 120 Hearing” with a specified court date. The majority of homeowners do not attend this court date, with the exception of members of the US Military Service and homeowners who have been making regular payments and believe the foreclosure was filed in error.